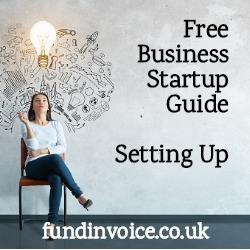 The first thing to say is that you will likely need the help of an accountant, and perhaps a solicitor to help with setting up your business. This article gives some general information based on our own experience, but your situation may vary. As I mentioned in the first part of this business startup guide, the key to a successful venture is having a product or service that is in sufficient demand, and can be supplied in a way that customers will prefer you over your competitors. Who will be involved in your venture? Is it just you or will there be other people that take an executive role? ("executive" means with an involvement in running the business). You may have others that are investors (that provide money for the venture) but don't have any involvement in the operation of the business. Who is going to control the business? If one person is going to be the controlling party, the structure of the business, and shareholdings if it is a limited company, will need to reflect that. It is worth noting that with a limited company you can have different classes of shares. Some purely reflect ownership and payment of dividends, others can be voting shares that allow control over the company. This is an aspect to discuss with your accountant as there are tax implications for how you structure your business e.g. a limited company, a limited liability partnership, a sole trader or a partnership. The simplest structure is a sole trader i.e. John Smith trading as ABC. However, with that kind of business structure the personal assets of the sole trader are not protected from the debts that the business is liable for. With say a limited company, the personal assets of the directors are not (normally) at risk if the company has liabilities it cannot settle. There are also tax implications from the different structures. The best approach is to discuss the options with an accountant. Another aspect of the setup is deciding on the business name. There are various rules around which names you can use, and if you go for a Limited Company structure, only one company can be registered at companies house with any one name. You may also need to check that your chosen name is not going to infringe anyone else's intellectual property. When choosing a name, you can search at companies house to ensure that it hasn't already been used, but you might also want to check that the related domain name is available for your website. There is also a marketing consideration to choosing the name of your venture. You may want to consider trademarking your name, to protect it from being used by other businesses. It is also important to check that noone else owns a trademark that your proposed branding impinges upon. As mentioned at the beginning, having an accountant is essential and in many cases a solicitor may also be needed, for example to draft legal agreements or terms and conditions, not to mention any agreement that governs the interactions between the controlling parties in the business e.g. the partnership agreement in the case of a partnership structure. it is a good idea to have an agreement in place between the controlling parties, in order to set out how they should operate. This will be essential for any business. You will need a bank account to receive and make payments. In addition to finding an accountant, you will need to decide how you will operate your bookkeeping and accounting. Will you outsource all that activity, which will result in a cost? Or will you undertake some of that work yourself? It is good advice to involve your accountant in helping you set up an electronic accounting system such as Sage (although there are many more). It may well be that you can handle the input yourself going forward, but involving them in the set up can avoid problems at a later date. Do you need to register for VAT (Value Added Tax)? In some trades you have to charge VAT on sales if your turnover exceeds a certain threshold. Your accountant will be able to advise you about this, or there is guidance on the VAT section of the Government's website. This is key to any business. Having the right funding in place. In many cases, a business will not be cash positive immediately, and there will be set up cost and ongoing operational costs to meet before revenue starts to come in. Funding may be required to bridge that gap. your cash flow forecasts should give you some idea of the amount of funding you are likely to need. These have been covered previously in the sections: Producing a Business Plan and Marketing. We have gone for the minimal number of staff in order to keep costs down and also avoid all the obligations associated with having people work for you. However, this will not work for every business, as many are labour intensive. Are you able to work from home? Even if just initially to get your business up and running with minimal costs. Or do you need to find a premises? If so there will be cost associated with it and this will drive up you overheads that you need to cover each month. If staff and customers are visiting your premises you will need to address issues such as health and safety, fire safety and insurances such as public liability and buildings related insurance, that may be required. Is there any equipment that you need to function? In our case it is very simple, laptops and printers. We even use an IP telephone system to reduce costs and avoid the need for expensive phone equipment. However some businesses require factory production equipment, vehicles or other plant and machinery to operate. If you have to make those kinds of capital purchases, there is finance available to help you buy plant and equipment. If you need help with IT Systems support or Telecoms support, and are based in Sussex, Kent or London contact Tecwork for help to get you set up, even if you are just 2 people. The web is such a core part of any business these days that it deserves a mention. Finding a good web designer is essential, as is keeping an eye on what will rank well in the search engines, rather than just what looks nice. You are also likely to want a logo designed for your business, and perhaps some guidelines as to which type fonts to use, colour schemes etc. Printed collateral would be things such as brochures, signage etc. If you need help with either the web or printed materials we have a full service marketing and design agency that will be able to help you. Trading licences for some types of businesses.The Government site has a good tool to find which licenses you may need. Trademarking and protection of your intellectual property.